Agreeing with the bastards: Picasso's Kahnweiler portrait kills. hhh Portland, I've been in that navel of the Midwest again  Chicago. The blue lint was pretty much as always; they have some damn fine blue lint in their museums. A standout, like Picasso's portrait of dealer Daniel Henry Kahnweiler at the Art Institute of Chicago, just kills me. I get mad, I get happy, I stamp my foot until I smile again. It washes over me like warm gusts of wind. 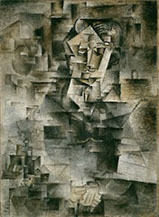 I think about how this is considered by most cognoscenti as the greatest of all the cubist paintings, and I get mad all over again, agreeing with the bastards who seem to tolerate so much schlock for social reasons. Yet they somehow got this one right? OK, I hate the small bits of gold in the Picasso's frame but basically it is a perfect, inscrutable painting. It has a dissonance, an apparition that is a hair away from being a joke but somehow Picasso's ironic use of white saves the whole thing from becoming a clown painting. Pure confidence and balls, Pablo gave his dealer Kahnweiler hell  but all the charm and camaraderie is apparent, too. Andreas Gursky's "Chicago Board of Trade"
Still in Chicago, I was less happy across town at the Museum of Contemporary Art, except for a nice Francesco Clemente and one of Warhol's Electric Chairs in a show about paintings and photography. Excepting Thomas Struth's big photos of people looking at baroque masterpieces and Andreas Gursky's equally large and often macrocosmic photographic clusters of human enterprise, I felt paint was both more vital and mature as a medium than photography. The photographers, except the two mentioned above, lacked the feeling of risk I got from that portrait of Kahnweiler. I found the show interesting  but only Clemente, Warhol , Georg Baselitz, Gursky and Struth gave me that feeling of love and terror that I crave. Too bad I was a month early for the full Gursky show. I prefer him to Gerhard Richter, who seems like a special-effects painter, a guy who increased painting and photography's vocabulary but wasn't able to wield those words like a maestro  like Gursky or Joseph Beuys. In a bit of strange synchronicity, PDX showed at Art Chicago a week before I arrived. Ellen George's show at Portland's refreshingly tiny PDX was one of its best. 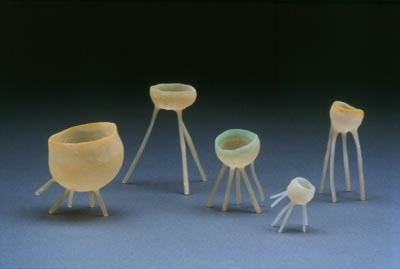 The smallish handmade forms evoke the delicate diatoms and mushrooms that startle us in the wild. Nobody living in Chicago, New York, London or Cologne (or 1914 Paris) could do this kind of work. It takes a romanticism that megalopolises can no longer generate. All of the works, made from polymer clay, force us to tread lightly and look closely. As a 200-pound-plus Norseman, I felt like a bull in a china shop. Works like "Custom Red" are like beautiful spores in need of protection and yet I could see these as possible agents of biological warfare. This show has elements of threat; wonderfully tiny things demand respect this way. Other works, like "Send," hit on equally salient biological releasing mechanisms (i.e. primal reactive associations to color, shape and texture). 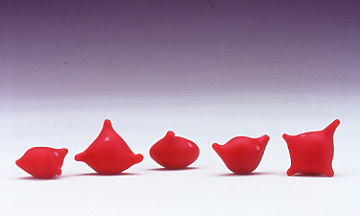 Its biomorphism evokes fruit, egg sacks and diseased polyps. Life and death, decay and growth are natural cycles and they are all here. The overall feeling is one of "be careful where you tread," and if PDX ever does take on a larger show-space, let's hope it keeps some equally intimate spaces  the kind that have allowed PDX to put on shows with this much respect. I'm certain that this overall respect is something that makes Portland unique and a bit more European than other New York/Chicago clones. It's all good  the world needs alternate approaches. New York has lagged behind Cologne and London for 10 years now. Maybe with PDX and Liz Leach showing at Art Chicago, the rest of the world will recognize where Portland leads the way.